Tucked away in the soft rolling hills, above the Missouri River Valley, lies the farmstead of Green Dirt Farm. 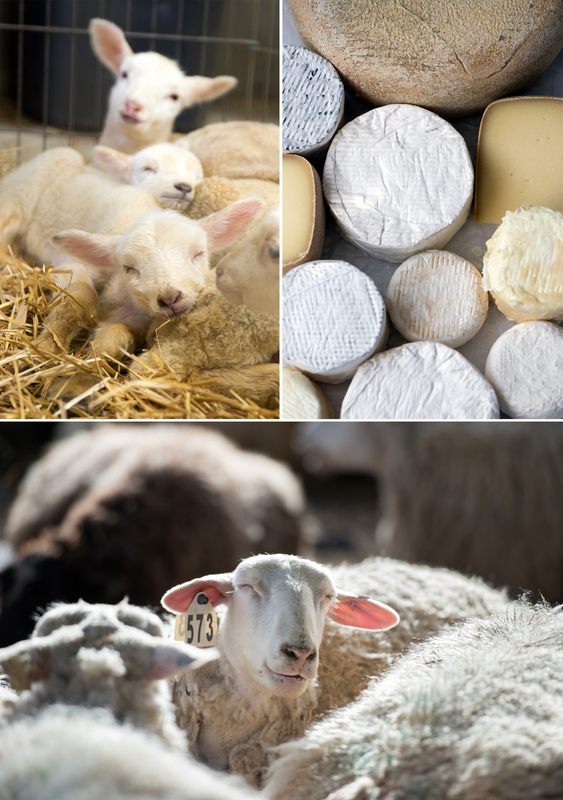 Owned and run by Sarah Hoffman and Jacqueline Smith, this community-based sheep dairy farm produces award-winning cheeses, yogurts, and 100% grass fed lamb. In February, I had the privilege of visiting this land with its picturesque views of the surrounding countryside. Even in the cold and snowy winter the farm was full of life and striking. The view of sheep slowly sauntering down the hillside, with the sparkling rising sun behind them, greeted me when I arrived. Near by, a farm dog carefully guarding them and the soft distant voices of workers on the morning shift. After a warm welcome from the owner, a tour was given, and it was time to begin my assignment. 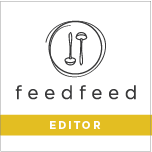 The photography assignment was for FEAST Magazine, a monthly large-format print magazine that features Midwest food culture in St. Louis, Kansas City, Mid-Missouri, and southern Illinois. Green Dirt Farm would be featured in their April issue and it was my pleasure to capture the daily life and production on the farm. The morning was spent with people who dedicated their lives to the practices and philosophies of gently raised grass-fed sheep and complete openness to how their cheeses are prepared and what goes into them. 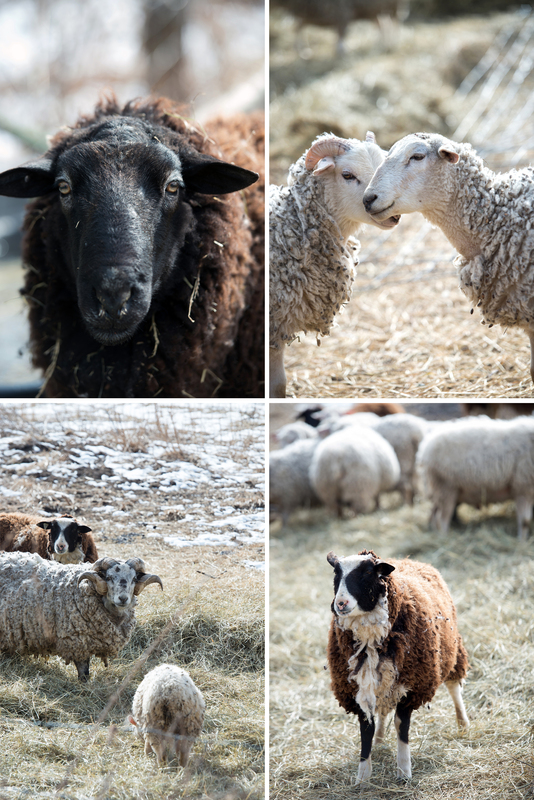 As an Animal Welfare Approved farm, the sheep are allowed to behave freely, socialize, and live comfortably. It was very apparent, that the animals were cared for and respected by the people surrounding them. Outdoors they frolicked and bounded over hay bales, smiled for the camera (so it seemed), and happily munched their grain during milking time in the milking parlor. After my visit, I couldn’t help but feel proud of the women who ran this farm and their staff who share in their passion. Accomplished and respected nationally, it is no easy task what they do. Every step of the production is thoughtfully and carefully executed. They are as creative as they are meticulous, which comes across in the wide variety of award-winning cheeses. Bossa, Prairie Tomme, Woolly Rind, Dirt Lover, Garlic & Peppercorn, Nettle, and Spicy Chilies and Rosemary to name several. If you have the opportunity to try any of their flavors, I highly recommend you do. Cheese itself is wonderful, but Green Dirt Farm takes it to another level. The only obvious option, after photographing the cheeses, was to go home and create a cheeseboard that included homemade crackers. 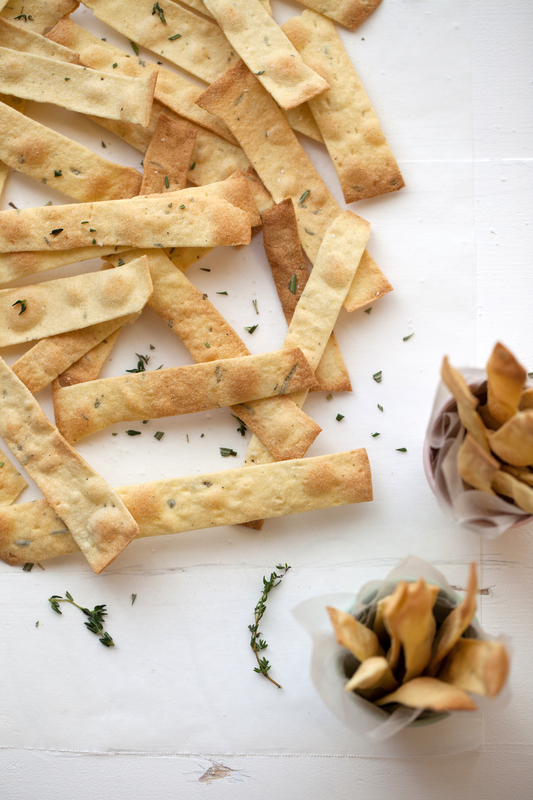 Semolina Herb Crackers that are rich yellow, crisp, and full of aromatic herbs. They hold up well to scooping up soft cheeses, chutneys, and salsa and are sturdy enough to hold a slice of firmer cheese varieties. The dough is simple to make and there are a few steps to the process, but completely worth it in the end. If possible, try making it with friends or family. The extra set of hands will make time fly and who doesn’t like playing with dough? Have fun with this recipe and add whatever herbs you like to the dough or sprinkle on your favorite cheese before baking. Be sure to allow the dough to bake until deeply golden around the edges to ensure a nice snap to the crackers. They are addictive while still warm from the oven, so I recommend having some cheese or chutney nearby to do some “quality assurance” testing. In the bowl of stand mixture, whisk together flours, salt, pepper, and herbs. Place on mixer and attach a dough hook. Add water and olive oil, then on low speed, mix to combine. Once dough has come together to form a ball, turn speed up to medium and allow to mix for 5 minutes. Dough should be tacky, not sticky. Remove dough from bowl and evenly divide into 3 pieces, lightly shaping them into round balls (approximately 150g each). Brush the surface of each ball with olive oil and cover with plastic wrap. Let rest for at least 30 minutes. Meanwhile, preheat oven to 450F and insert a pizza stone if you have one available (if not, that is ok). Prepare a pasta machine attachment or counter top pasta roller for when dough is ready. If neither is available, you may roll the dough out by hand using a rolling pin (it will just take a little more elbow grease and time). Gather three sheet pans and set aside. When dough is finished resting, flatten one ball with the palm of you hand. Sprinkle is generously with semolina flour, on both sides, to prevent sticking in the pasta roller. At the pasta roller’s highest setting, pass the dough ball through to flatten evenly. Dust both sides of the dough generously with semolina flour again. Repeat the process, gradually adjusting the roller down until you reach setting ‘4’ (or 1/8 inch in thickness). You may want to find a helper, for a second set of hands, at this point since the dough will be very long and thin. Roll a dough docker over the entire surface, or use the tines of a fork to prick evenly across the surface. Cut dough into whatever shape and size you would like. In this case, use a pizza wheel to cut dough in half (vertically). Transfer halves onto a sheet pan, then cut dough into even vertical strips. Bake for 8-10 minutes or until golden brown. While dough bakes, continue the entire process with the remaining dough balls. When each sheet pan of crackers is done baking remove from oven and place on cooling rack. Enjoy them warm from the oven or once cooled transfer to an airtight container. They will keep for up to one week. Thanks so much, Theresa. Love your blog and your photos! And these crackers sound delicious- will have to make some. I think they are going to be wonderful with our Fresh cheese! Thank you for the inspiration and for your generous hospitality during my visit. I’m so happy you enjoyed this post. 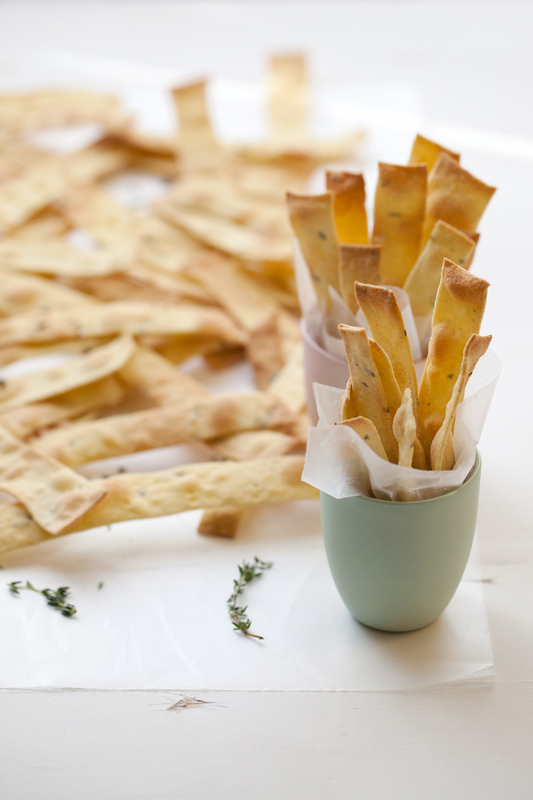 Yes, these crackers are wonderful with your fresh cheese. Together they are almost too addictive. :) Thank you for stopping by!